It has been an amazing week for Kenya’s ICT sector. 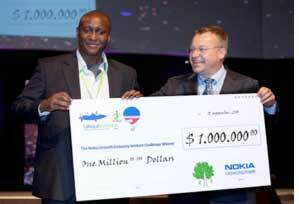 First, one of our own, Murags (aka John Waibochi) became the proud care-taker of a million dollar enterprise after his company won the top prize in the Nokia’s Growth Economy Venture Challenge. Contrary to the belief of most, this cash prize was not petty cash to fund Mr Waibochi’s out of town excursions, it is crucial venture funding that Virtual City’s presents to Kenya with the unique opportunity to officially get its software development aspirations off the ground, providing scope to create new revenue earners for the economy. In addition, the fact that a young Kenyan can create a mobile solution that will be scaled worldwide is a tremendous feat that should inspire many Kenyans to think globally. Just days earlier, Excelsior Firm, a US-based consultancy, held a day-long forum for others like Mr Waibochi who hope to break into the world of ICT entrepreneurship. Excelsior was conducting a sit-down with local developers seeking to find out what needs to be done to get more Kenyan companies on the global map, on behalf of the World Bank/infoDev, Hivos, and UKaid. The project aims to understand the environment and challenges facing SMEs in the East Africa ICT sector through robust analyses and fieldwork, and intends to identify specific strategies and implementation plans to address these challenges. Meanwhile, Huffinton Post– an online newspaper– tipped another of our own as one of the world’s technology game changers. By the time this paper went to press, Ory Okolloh was ranked as the third most influential person in the world on the poll, which seeks to celebrate 100 innovators, visionaries, and leaders who, whether working in the spotlight or under the radar, are changing how we look at the world and the way we live in it. Ms Okolloh’s work with the Ushahaidi platform–a crisis application developed following the outbreak of post-election violence in 2008 -put her on the global list. Africa has been described as the next ICT frontier, with the continent expected to form the most exciting and dynamic market for the next 10 years as over a billion people begin to harness the internet and related services for social and economic gain. Despite the topline successes being enjoyed by the likes of Virtual City, very few Africans are actively involved in the decision making when it comes to who is getting access to vital ICT services. The time to change that, it appears, has never been more urgent. Source:Business Daily Kenya. Image:ITNews Africa.